Before I got my hands on the COSRX AHA 7 Whitehead Power Liquid, I’d been using Paula’s Choice 8% AHA Gel for many months. I’m glad I made the switch. For my skin, the COSRX has rapidly proven much more effective, and my bank account enjoys the significantly lower cost. Let’s take a look at what COSRX AHA 7 Whitehead Power Liquid has to offer. The plain, almost clinical aesthetic of COSRX packaging is a great fit for their simple, functional products. Purpose: COSRX AHA 7 Whitehead Power Liquid is an alpha hydroxy acid chemical exfoliation product. It dissolves the bonds between dead skin cells to enable faster cell turnover, reducing acne and revealing brighter, clearer, smoother skin. The AHA 7 Whitehead Power Liquid is also lightly hydrating. Do not use if: You are currently suffering from overexfoliated skin (signs include increased roughness, scaliness, sensitivity, redness, or a shiny but dry appearance and texture) or are sensitive to glycolic acid or anything else in the ingredients list. When and how to use: Once a day after cleansing, spread COSRX AHA 7 Whitehead Power Liquid over clean skin. It is best to use on skin that is as close to bare as possible, then wait for 30 minutes if possible before applying more products. If you also use a BHA product, apply after your BHA to take advantage of the BHA’s oil solubility. The order of acids in my skin care routine is pH adjuster (COSRX Natural BHA Skin Returning A-Sol), vitamin C serum (C21.5) with a 20-minute wait, BHA (COSRX BHA Blackhead Power Liquid) with a 30-minute wait, then COSRX AHA 7 Whitehead Power Liquid with a 30-minute wait. Many people, including me, consider the wait time following acids to be critical for achieving maximum results. Chemical exfoliants work best at a low pH, with the recommended range between 3 and about 4.5. Below 3, the product will be too acidic and may cause irritation or even chemical burns; above 4.5, and the product’s effectiveness drops significantly. It takes about 30 minutes for a product’s pH to neutralize and therefore for a chemical exfoliant to become ineffective. Applying another, higher-pH product immediately after a chemical exfoliant therefore arguably cuts short its effective time and limits the results you’ll see from the product. Unfortunately, there is little research specifically into this, so we’re just going by common sense here. Finally, two cautions for those who are new to chemical exfoliation. If you’ve never used a correctly formulated AHA before or have sensitive skin, introduce products like the AHA 7 Whitehead Power Liquid slowly. Apply once a day every third day for a couple of weeks and then go to every other day for a couple of weeks before you move to daily use, and dial back the frequency if your skin begins to become irritated or overexfoliated. And always wear sunscreen! AHAs are photosensitizing, so unprotected UV exposure will lead to increased sun damage. It doesn’t matter whether you put your AHA on at night or in the morning, either, as the photosensitivity will persist for 7 days after application. That may seem like a lot of cautions, but trust me–this product is worth it. If you have great eyesight and can read Korean, here’s the label for you. And the inner label that’s uncovered when you peel back the outer. Notable ingredients: As you can see, the ingredients list for the COSRX AHA 7 Whitehead Power Liquid is short and sweet. Unlike many other products, this one doesn’t use water as its main ingredient. Instead, this product is apple water-based. As COSRX Marketing Team Assistant Manager Lee Hye-Young explained to me in our COSRX interview, apple water contains natural AHAs, boosting the exfoliating power of the 7% glycolic acid while maintaining the product’s relative gentleness on skin. The AHA 7 Whitehead Power Liquid also contains niacinamide, which by this time we all know is a brightening, barrier-strengthening, oil-controlling, anti-aging workhorse ingredient. Sodium hyaluronate, meanwhile, helps keep skin hydrated. A CosDNA analysis of this product turns up only one warning: the common slip agent and penetration enhancer butylene glycol scores a 1 as a potential acne trigger. Butylene glycol is incredibly common in Asian skin care products; if you use other products containing it without issues, chances are good that it won’t trigger you in this one, either. Since the COSRX AHA 7 Whitehead Power Liquid is an AHA chemical exfoliating product, the first thing we need to talk about is its pH. Wishtrend’s listing for the product claims that it has a pH of 4, near the upper end of the effectiveness range. My own simple pH test puts it in that same range, though possibly a couple of decimal points lower. After a lot of squinting and agonizing, I’m going to say it’s about a 3.8 or so, according to my strips. The relatively high (though not deal-breakingly so) pH of the product may explain its gentleness in comparison to comparable AHA products. 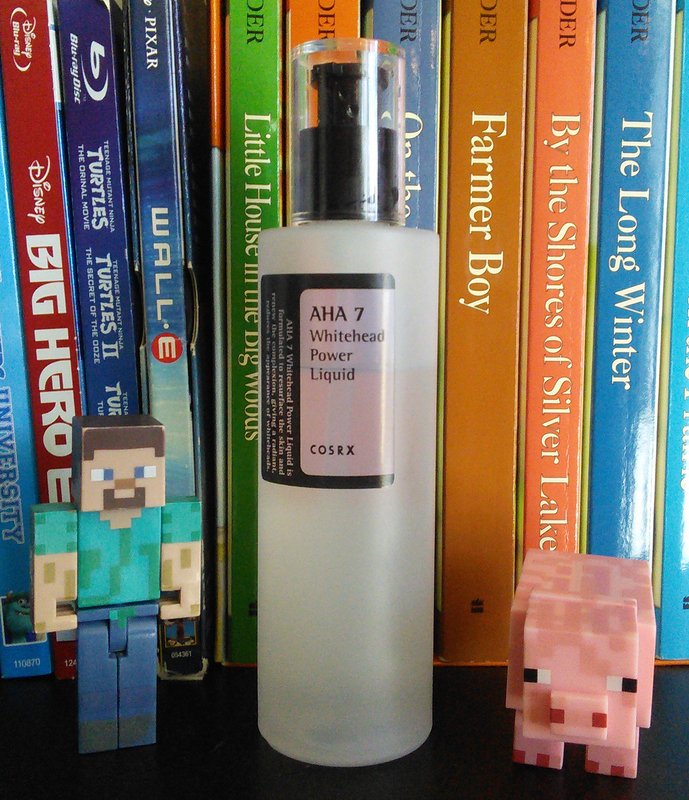 COSRX AHA 7 Whitehead Power Liquid is a thin, slippy, clear liquid. I prefer liquids over gels and lotions for my chemical exfoliants, as they absorb more thoroughly, creating less of a potential barrier to all the essences and serums and ampoules I apply afterwards. This product smooths easily over skin. Unfortunately, it smells like the A-Sol of the devil himself. I’m not kidding. Holy crap. I talked a bit about the smell in my First Impressions look at this product. It really is strong. It’s acrid and chemically, with notes of scorched rubber. The smell doesn’t linger, however, and after a couple of weeks, you’ll go nose-blind to it, so don’t let that put you off. I also haven’t heard any complaints from Mr. Crazy Snail Lady about the smell, and he’s not shy about letting me know if something I’m using doesn’t smell good. I’ve used this product every night for over a month now, and I’m here to tell you that it has done amazing things for my skin. 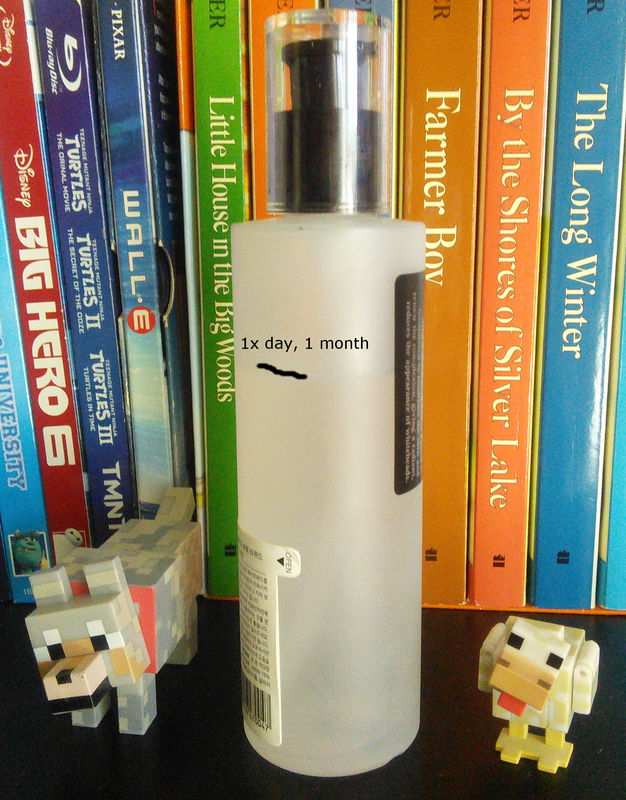 After a month, I can see that the 100mL bottles hold enough product for several months’ use, making this a very economical choice. Overall, my skin is brighter and feels much softer. The COSRX AHA 7 Whitehead Power Liquid has dramatically smoothed and refined my skin’s texture as well–I’d even call my skin “silky” these days. The colony of tiny little closed comedone bumps I’ve always hosted on my forehead are vanishing like Roanoke villagers, and a few invisible clogs on my cheeks have purged out and gone–I get far fewer grits when I oil cleanse these days than I have before, because there are simply far fewer grits to get out. I haven’t experienced any irritation or overexfoliation from daily use, nor have I broken out from the product, besides a few tiny little purge bumps that disappeared within a day. As I mentioned earlier, I’ve become nose-blind to the odor of the stuff, so that’s no longer a problem for me at all. Conclusion: Though I’m deducting a couple of decimal points for the truly heinous smell of the COSRX AHA 7 Whitehead Power Liquid, I still feel comfortable in awarding this product with Holy Grail status. It’s done everything I expect a daily use AHA to do. I’ve found it much more effective than the Paula’s Choice 8% AHA Gel, which never eradicated the bumps on my forehead or purged out the clogs hiding in my cheeks. And it’s much more affordable, another serious plus. Where can I buy COSRX AHA 7 Whitehead Power Liquid? ← I did a thing to my nails. Thanks for ur informative blog! I really enjoyed reading it. I’m new to cosrx and AHA/BHA products but after reading ur blog post I’d really like to try them. But I have a few questions cos I’m not sure what products I should buy. I know I need to take it slow when introducing new products especially the brand that I’ve never tried before! So would like to know ur suggestion which I should try first. Thanks and sorry for the long question! Hi Fiddy, how exactly would I use the bha and aha along with the vit c? I would wait 30 min after applying the aha and then apply the vit c ? Hi where can i listen to the episode you mentioned? Thanks for your review on this product. I would like to know if it is safe to use under the eye area? I have fine lines under my eyes, but not sure if this project is suitable for that area. Thanks. Hi, I hope it’s okay to reply even though I’m not Fiddy. I avoid using acids under and around my eye area as the skin is quite fragile and I don’t have any issues in the area. The only active I use on my eye area are trets and only because my derm gave me a go ahead to do so- I have to say that they’ve worked really well for me. Hi Liddy, cushion is most definitely not enough especially with an AHA ☺️ Is just not possible to put on an adequate amount of sunscreen that way, so you’ll get almost no protection. Definitely look for a good sunscreen! Hi,do i have to avoid eye area when using cosrx aha 7? And i have cosrx snail essence, and red serum from skin&lab, do i have to use it before or after aha? And is it okay to use aha 7 everyday? Hi there! Just wanted to say thank you for posting such an informative blog about this product. I’ve recently just bought it and had zero idea on how to use it as it’s my very first AHA. I’m hoping to get rid of my little bumps on my t zone area and of course improve the overall look of my skin. Just really glad that I found your blog! Keep it up! Hi there! Nicely written, detailed but none draggy. Love your blog! Here’s a question, i don’t use sunscreen but i do apply bb cream that has spf 50 PA, would that be enough/safe? Is it necessary to use both AHA and BHA products? Is this more effective? Harsher? Do you normally use both every night? I’m new to this so I normally wash my face then apply toner, then immediately apply BHA, wait 30 minutes then apply Snail 96 Essence. Is this the correct order? Should I also be throwing in moisturiser on top of the Snail Essence? First – Love your blog. It has been a staple over the last 6 months as I am new to AB. Next….I am in need of the AHA action to address closed comedones – but my skin is SOOO sensitive. I can barely use this once per week. I tolerate the A-Sol better and the cosrx bha power cream (on alternating days, then skip the 3rd day) but it isn’t enough to help with the closed comedones. The COSRX website recommends rinsing the AHA off after 4-5 minutes with plain water, then proceeding with the rest of the evening routine. What are your thoughts on rinsing after the AHA? 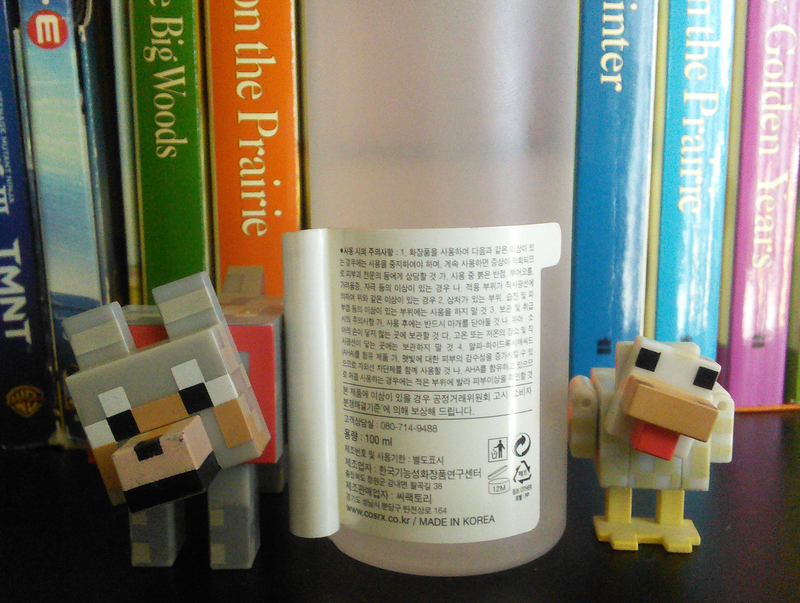 I love how those Minecraft pig, chicken and dog staring at me when im looking at the pictures, hahah! Hahaha! I’ve been tempted to buy a few more cute little figurines to use as props! I’m so bummed! After reading your glowing reviews of A-Sol and Whitehead power liquid, I bought both then integrated A-Sol into my routine for a few weeks – the first few uses were great. Then, I made the stupid mistake of incorporating the Whitehead liquid into my routine and I have the classic signs of over-exfoliation and am dealing with the aftermath. It’s definitely not for everyone, and not for those with sensitive skin no matter how little it is used (A-Sol every two or three days, Whitehead once a week). I’m going to stick with my plain old physical exfoliation, be happy with the handful of pimples I get a month (hormonal) and continue using my no-issues-ever Sulwhasoo products. 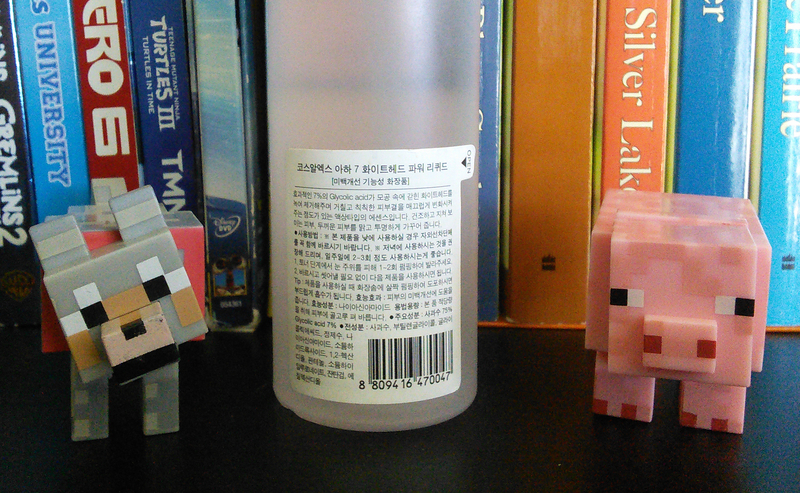 I do love the Cosrx Galactomyces whatever liquid – that stuff is awesome combined with Sulwhasoo’s Brightening Fluid. Talk about super-glow! Oh no! How’s your skin doing now? I wouldn’t rinse. Those are both leave-on products that won’t harm you if left on (and I don’t really think rinsing will do anything, since you shouldn’t be applying so much that you would need to rinse before putting on anything else). Just let the toner and AHA product dry, give a few more minutes if you choose, and move on to the next product in your routine! hai, after I read your blog, I want to try BHA and AHA products. I want to ask you about when i use this product, my daily routine is using facial wash, facial toner, essence, serum, moisturizer, and sun cream? thanks for your information. Hi there! Loved your blog and thank you for the detailed information on the product. However, can you recommend what essence or serum should we be using after using AHA? There are so many! It really depends on your skin goals and priorities 🙂 I have a lot of essence and serum reviews here if you wanna poke around and see! Oh I was about to ask the same thing. Some of the usual skincare steps that I had no trouble with seem to tingle when I use them after using Cosrx AHA.. Even the beloved Cosrx Snail Mucin Essence tingles after using AHA (after 1-hour waiting time). I have avoided Niacianimide-contained products after AHA. I wonder if you have experienced something like this. Thank you for this wonderfully informative blog post. I’ve been using Skin Doctors, gamma hydroxy cream for years and I don’t think I would ever be without it. It contains both AHA and BHA. I saw tons of positive reviews of the Cosrx products on YouTube and blogs so I bought the BHA Blackhead Power liquid and the AHA 7. The Skin Doctors cream is expensive and if I could switch to using Cosrx I would save on money, I thought. Around the same time I received those two products I also started using Vit. C serum ( C 21.5) Right or wrong, I I started using all three products all at once one after the other waiting 20 min between products and so on, but my skin did not like them. I started getting a lot of breakouts-small, big, medium size ones. It was shocking and painful. Some call it purging. Whatever you call it, I didn’t want it. Because after the breakouts I would have to deal with the scars which are so hard to treat. After a week, I stopped all three products and returned the Vit. C serum, but couldn’t return the Cosrx products. I wonder if others have had a similar experience? Because I was used to AHA and BHA products, I was very surprised to get breakouts from using the Cosrx products. I wonder if the Skin Doctors cream has only a small percentage of AHA and BHA and then perhaps the Cosrx products were too strong for me? I still have the Cosrx products but until I understand why my skin did not like them, I am afraid to start using them again. Please advise. I really want to try this product, but I’m concerned about the increase of sun damage. I’m 17 and still go to school, so I don’t earn my own money yet. This product would be expensive for me already. And I didn’t plan on buying sunscreen before summer starts since I’m only outside for 1h a day.. Do I really need a sunblocker if I’m mostly inside and it’s winter? OK I guess I’ll buy sunscreen.. Do you have any suggestions for affordable sunscreen that doesn’t leave a sticky feeling or websites where I could find suggestions? If you click the sunscreen category in the dropdown menu on here, you can find some sunscreen reviews! I’m partial to Biore Watery Essence, which isn’t sticky or oily but offers high protection! I plan to try the Cosrx AHA as I have few samples from my recent purchase. Do I have to apply toner before the acids or just apply them immediately after cleansing? I do acids right after cleansing, no toner before. Hi.. I’m wondering what step i should do after aha or bha? Is it essence or serum? I’ve tried different products as a male to fight whiteheads on my nose, but never a “chemical” product like this one. Should I try this product? I think chemical exfoliants are generally the most effective way to combat those sorts of skin problems, yeah! They provide a more even and deeper penetrating exfoliation than a scrub will. Hi! I bought this product after reading your review and I’ve been using it for more than a month now. But I’m not sure if it’s working the way it’s supposed to.. I have got many many whiteheads on my cheeks and on my chin, and I feel like I’ve gotten way more whiteheads since I’ve started using this product. and they just won’t go away. how long does purging normally last? or should I just stop using it and try another one? Hi! Is this okay to use after applying toner that consists of diluted apple cider vinegar?? btw have you heard or even tried The Ordinary Glycolic Acid 7% Toning Solution? if you’ve done, cud you mind to compare which one works better between Cosrx’s and The Ordinary’s? i super curious, many peoples say that the ordinary GA does it job as well as Pixy Glow Tonic and even more?! plus it doesn’t irritate the skin even if used daily. How do you layer / alternate the actives with the tretinoin you are using? I’ve done it both ways. Sometimes I’ve alternated nights, and on other nights, I layer them, using the AHA first, waiting for it to fully absorb/dry, then adding the tretinoin and giving that 20 minutes. Is it better to start with the AHA or BHA when adding these steps to your routine? Or should you go by skin concern (I’m more frustrated with cystic acne than blackheads but I was looking to try out this and the blackhead BHA). Also, should the BHA and Vitamin C serum be applied once a day like you stated this product should be? Thanks for the amazing post by the way! They are BEYOND helpful!! Hi! It really just depends on your skin concern, as you said. I’d start with the AHA since you’re more frustrated with acne than blackheads. And yup, once a day is fine! I just bought this and I have 2 more questions for you if that’s ok. Do I apply this to my whole fave or just the areas that are breaking out and do I need to apply sunscreen after if I apply this at night? You can do it either way, and yes, definitely apply sunscreen even if you use it at night! The photosensitizing effects of AHAs persist for about 7 days from the last application. hi. I know I am late at your review. I am just wondering of Vitamin C included in chemical skincare. I have do some research saying that I shouldn’t use Vitamin C with the AHA/BHA. I already have the Wishtrend Vitamin C20 and want to add AHA in my skincare routine. so, I am wondering is it okay for your skin and how it’s react with your skin? Hi! Ive been using this one for a couple of days, with other cosrrx serum and ampoule. Im just wondering, i bought loreal revitalift x3 but im not sure “what part” should i use it. After serums or ampoule? or after toner. Please enlighten me if you have some idea. I would really appreciate it. Thanks much! I guess I’m a bit late, but I’m slowly trying to introduce different actives to my routine. Would you recommend taking all the actives at once (of course with the waiting times), or trying cycling them through each day? Moreover, beside having the actives, what would be the essentials that should be in a routine? Can you leave AHA 7 whitehead power liquid overnight? And also are you supposed to apply it all over your face or just in specific areas like blackheads, whiteheads, or wrinkles? Hi. Im currently using cosrx aha 7. And i want to include in my routine the soon jung toner, i wonder how to apply them in correct order. Soon jung toner has a ph 5.5 , should i apply the toner before aha. Or aha and then toner? Hello ! How do you apply this product ? With your palms or cotton pads ? would it be better to put on AHA during the night rather than the morning due to sun exposure, or does it not really matter? It doesn’t really matter. The sun sensitivity doesn’t come from the product interacting with the sun, but rather from the effect of surfacing much newer (and more defenseless) skin. The sun sensitivity will also persist at least 7 days after the last time you use the AHA.